If there is one complaint I hear more than any other about aging, it’s the decline of energy most people begin to feel in their 40’s… and that continues – and worsens – with every decade. 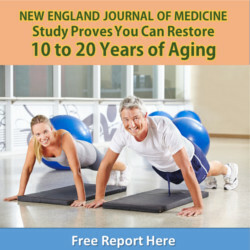 Aging may be natural, but so is energy and vitality. And feeling more energetic at any age can dramatically change how you feel about your age, regardless of what number you’ll celebrate on your next birthday. If you understand some of the causes behind this energy drain, it will be easier to reclaim your get-up-and-go. If you don’t believe me, just browse for a birthday card for anyone age 40 and up – the message is loud and clear: You should expect to feel less vital and alive with every year that passes. Then, on the opposite end of the spectrum, I see patients who chase down and try every energy cocktail under the sun. Only to be disappointed when so many don’t live up to the hype. It’s such a critical issue, and so misunderstood, that I want to spend the next few issues going into aging and energy in more depth. Before I reveal my first energy-boosting recommendation, I want to make something clear. There are a multitude of reasons for feeling tired and lethargic as you get older. And there are a number of drugs, both over-the-counter and prescription, which can affect your energy. Antidepressants, blood pressure meds, antihistamines, antibiotics, diuretics – can all make you feel tired. This is another important reason why you must report feeling tired to your doctor, and get to the root cause, rather then simply tell yourself it’s “normal” to have less energy as you age. Once I’ve ruled out the more obvious causes and conditions, I usually discuss CoQ10 with my patient. This vital nutrient is found in just about every cell of your body. It is to energy what the heart is to the body – vital for survival. It is the key element used by the body to produce energy on a cellular level. Discovered just a little over 50 years ago, the CoQ10 breakthrough advanced our understanding of energy production dramatically. One biochemist, who pioneered our understanding of its role in biological energy transfer, even won the Nobel Prize for Chemistry in 1978 – and the studies have not stopped since. Researchers have found CoQ10 deficiency in people with cancer, heart disease, diabetes, Parkinson’s and other neurodegenerative diseases, immune system conditions, and even gum disease. And those who take statin drugs are at the highest risk of deficiency, as the statin hinders the body’s ability to produce CoQ10. I have yet to meet anyone over the age of 40 who wouldn’t benefit from adding more CoQ10 to their cells. Usually, it provides such an energy boost, you feel the difference within a day or two. The trick is making sure you get the right amount, in the right form. Usually, I give you tips on what to eat first to boost nutrient levels in your system. But CoQ10 is manufactured by the body – and hard to find in any great quantities in food. Fortunately, you can supplement with a reduced form of CoQ10 called ubiquinol. Ubiquinol is easily absorbed, combines with Vitamin E and beta-carotene to form a super antioxidant blend for your cells, and then, converts to CoQ10. I recommend 100 mg./day if you are not on statins, and at least 200 mg./day if you are on statins. While CoQ10 is not found in food in high quantities, your body’s ability to produce CoQ10 can be enhanced by what you eat. One study specifically compared CoQ10 levels of people who ate a standard American diet with those who followed a traditional Mediterranean Diet – the diet I recommend, with some modifications. Predictably, those who ate the Mediterranean Diet had less inflammation than those who ate the Standard American Diet. But those who supplemented with CoQ10 and followed a Mediterranean Diet had significantly enhanced results. Simply having more energy and lowering inflammation could make a major difference in the quality of life of older adults. In the next issue, we’ll look at another critical source of energy – food energy. You might be surprised to learn there is a hormone in charge of your appetite – and all the willpower in the world can’t fool it into working properly. But there is something that can. Be sure to follow along for the next issue to find out how you can simultaneously lose weight and gain energy in one easy step. Catarina M., et.al., CoQ10 Deficiency Diseases in Adults , Mitochondrion. 2007 June; 7(Suppl): S122–S126. Which Side Is Winning Your Hormonal Tug of War? Is There Really a Gene That Switches on Your Youth? Is This the Key to Anti-Aging? This entry was posted in Live Longer Lose Weight and tagged energy, ubiquinol, youth on July 4, 2012 by Advanced Natural Wellness.